We made it really easy for you to make a payment or down-payment on your next new car. You can put a vehcile on hold until you will have time to finalize the purchase. Options: ACTIVE STEERING, PREMIUM SOUND PKG, BMW APPS, RUNNING BOARDS, SPACE-SAVER SPARE, CONVENIENCE PKG, HARD DRIVE-BASED NAVIGATION SYSTEM, Y SPOKE (STYLE 335) 19, SATELLITE RADIO, M SPORT PKG, COLD WEATHER PKG, DOUBLE SPOKE (STYLE 333M) LIGHT ALLOY WHEELS, 20, COMFORT ACCESS KEYLESS ENTRY, DARK BAMBOO INTERIOR WOOD TRIM, DEEP SEA BLUE METALLIC, OYSTER, NEVADA LEATHER SEAT TRIM - Thank you for choosing Autos-Mobiles to shop your next vehicle purchase. We aim to offer outstanding values, low prices, quality brands, and a courteous, no hassle, no pressure car buying experience. We offer: Financing 1 Warranties, Auto Insurance, shipping 3, and Buy cars and Pay more for clean Trades . Call us NOW at 713-999-4933 OR email us at autos.mobiles@gmail.com with any questions about this vehicle or the services offered. * This BMW includes: ACTIVE STEERING Power Steering PREMIUM SOUND PKG Satellite Radio BMW APPS RUNNING BOARDS Running Boards/Side Steps OYSTER, NEVADA LEATHER SEAT TRIM Leather Seats CONVENIENCE PKG Multi-Zone A/C Keyless Start Engine Immobilizer Navigation System A/C Climate Control Back-Up Camera Universal Garage Door Opener Power Door Locks Keyless Entry Rear A/C HARD DRIVE-BASED NAVIGATION SYSTEM Navigation System Y SPOKE (STYLE 335) 19 Tires - Front Performance Aluminum Wheels Tires - Rear Performance DARK BAMBOO INTERIOR WOOD TRIM Woodgrain Interior Trim SATELLITE RADIO Satellite Radio M SPORT PKG Tires - Front Performance Aluminum Wheels Leather Steering Wheel Tires - Rear Performance DEEP SEA BLUE METALLIC COLD WEATHER PKG Heated Rear Seat(s) DOUBLE SPOKE (STYLE 333M) LIGHT ALLOY WHEELS, 20 Tires - Front Performance Aluminum Wheels Tires - Rear Performance COMFORT ACCESS KEYLESS ENTRY Keyless Start Engine Immobilizer Power Door Locks Keyless Entry *Note - For third party subscriptions or services, please contact the dealer for more information. * How to protect your purchase? CARFAX BuyBack Guarantee got you covered. In their original incarnation, SUVs were chiefly owned by folks who valued utility above sport. Not anymore! The BMW X5 35i Sport Activity redefines the SUV and makes the perfect all around family companion. There's a level of quality and refinement in this BMW X5 that you won't find in your average vehicle. This BMW X5 is equipped with AWD for improved handling. Whether you're faced with inclement weather or just out enjoying the twisting back road, you'll have the grip of AWD on your side. You can tell this 2012 BMW X5 has been pampered by the fact that it has less than 89,297mi and appears with a showroom shine. Put away your phone and focus on the road, your new vehicle has navigation. Marked by excellent quality and features with unmistakable refined leather interior that added value and class to the BMW X5 Treat yourself to a wonderful driving experience in this wel- optioned BMW X5 35i Sport Activity. Equipped with the latest in driver comforts, this BMW is the benchmark of modern automotive engineering. 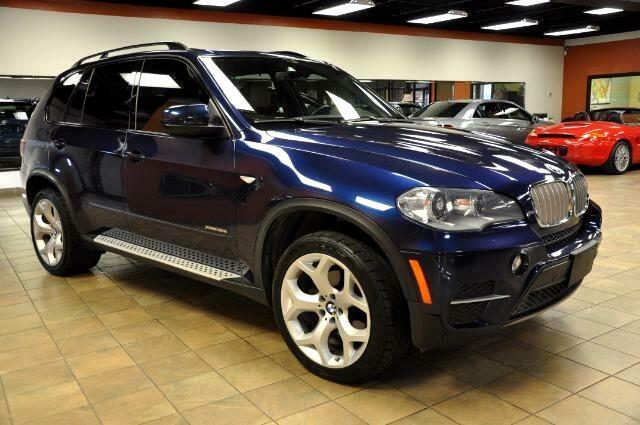 The perfect balance of speed and control has been injected into this 2012BMWX5. Looking for a BMW X5 that is in great condition inside and out? Take a look at this beauty. Equipped with upgraded wheels, this BMW X5 is stunning to see driving down the street. More information about the 2012 BMW X5: BMW's X5 offers seating for seven with high-tech on- and off-road capabilities. And with all-new styling as well as a host of refinements for 2011, the package has become even tighter. Although it ranks among the more expensive SUVs in its class, it's a strong competitor, offering a wide range of options not found on the Acura MDX, Lexus RX 350 or Mercedes-Benz M-class. Interesting features of this model are BMW luxury and build quality, standard all-wheel drive, new more powerful engines. We aim to provide quality brand vehicles at lower prices. We make every effort to present information that is accurate. Autos-Mobiles depends on third party sources for information provided on each vehilce. Therefore, no responsibility is assumed by Autos-Mobiles or its agents for errors or omissions in this listing. Autos-Mobiles further expressly disclaims all warranties, expressed or implied, including any implied warranties of merchantability or fitness for a particular purpose. Most information and options provided in the options lists are based on data provided by VIN decoding software and/or other resources and vendors. All vehicles presented by Autos-Mobiles are pre-owned, hence listed configuration, color, specifications and accessories should be used as a guide only, and may be different than when manufactured and are not guaranteed. Our Descriptions are based on visual inspection and test drive of each vehicle and represent our agents professional opinion of the vehicle. Under no circumstances will Autos-Mobiles or any of its agents or vendors be liable for any inaccuracies, claims or losses of any nature as a result of the information provided. It is up the buyer to confirm the condition and desired option with the seller if known, or through a personal or professional inspection before purchasing the vehicle. All used vehicles should be assumed to have some degree of cosmetic and mechanical wear . We do not manufacture our products. Each make and model has its own strengths, style, tendencies, and shortcomings. Therefore, despite our best efforts to verify and describe a vehicle's condition, we are not able to warranty a manufacturer's workmanship or a previous owner's diligence in care. It is for this reason that all vehicles are sold "AS-IS". If you are not sure about something, Please do not hesitate to ASK US. Autos-Mobiles welcomes and strongly recmmends on-site pre-buy inspections before the purchase. Once the vehicle has been accepted by the buyer, his or her authorized representative or the shipping company, our responsibility ends. If upon a professional inspection of this vehicle, prior to delivery and at our facility only, buyer or his/her authorized representative finds a substantial discrepancy between the published report and actual vehicle, we, at our option, will either correct the problem, work out a compromise, or refund paid amount less the non-refundable deposit. Out of state buyers: $125 Doc. fee, $5 E-TAG fee and Inventory tax of 0.218% Ex. $10,000 purchase=$21.80 VIT Tax, and $135 Dealer Services fee which includes detailing the vehicle, inspecting and checking tires and fluids before shipment or sale, and 25.50 state inspection fee. Texas Residents: 6.25% Sales tax, title fee $33, license and registration fee $82.25 for vehilces under 6400 lbs., $85.50 for vehicles over 6400 lbs but under 10,000 lbs. GVW Approx., trucks over 10,000 lbs. will be more depending on weight, , $125 doc fee for handling paperwork, filing titles, mailing and copying costs, $5 Temporary E-TAG, 0.218% inventory tax and $135 Dealer Services fee which includes detailing the vehicle, inspecting and checking tires and fluids before shipment or sale, and $25.50 state inspection fee. These fees are fixed and non-negotiable. All advertised prices are cash prices only and we reserve the right to change the price without prior notice. The document and dealer service fees are collected by Autos-Mobiles and are not required by law. CALL US IF YOU HAVE ANY QUESTION AT 713-827-1212. Designated trademarks and brands are the property of their respective owners. The brands and logos of third-parties are provided for reference only and are not intended to imply endorsement of that company's services by Autos-Mobiles or its related companies (collectively "Autos-Mobiles"), or suggest a relationship between Autos-Mobiles on one hand, and the third-party company on the other hand. For more information about each third-party, it is suggested that you visit their respective website and become familiar with the scope of its services and its terms and conditions. Unless stated otherwise, every vehicle is sold "as is" "where is". Manufacturer's warranties may still apply. An extended warranty may also be available for purchase. No representations or warranties are made by the "Seller", nor are any representations or warranties relied upon by "Bidders""buyer" in making bids or offers to purchase. We do our best to disclose all information known about this vehicle. We welcome a Buyer's Inspection. If you plan to have a Buyer's Inspection, please make sure you have the vehicle inspected prior to the end of the auction. Inspection fees, if any, are the "Buyer's" sole responsibility. Due to demo test drives and mechanical inspections, the mileage of the vehicle represented might be slightly different than the mileage stated when the vehicle was first listed. Vehices older than 10 years and/or have more than 100,000 miles are sold as miles exempt. The buyer is responsible for all shipping charges. We can assist in arranging SHIPPING worldwide. Please provide us with a destination and we will provide a reasonable quote through a verified and insured carrier for you. Full payment must be received before the vehicle is delivered to the shipping company. Autos-mobiles is not AFFILIATED with any shipping company and this service is provided solely as a convenience for our buyers, therefore we do not assume any responsibility once the vehilce has been released and left our premises. Any Agreements and documents related to sales transactions with Auto-Mobiles are signed by the Dealer in the State of Texas. Any issue or dispute related to such agreement, any other document signed in connection with same transaction or the transaction itself are subject to the Laws of the State of Texas without regard to choice of law issues. All obligations pursuant to this contract shall be performable in Harris County, Texas. The vehicle shall be delivered F.O.B. in Harris County, Texas and all obligations of Purchaser to pay for the vehicle shall be payable in Harris County, Texas.